This past weekend I had the pleasure of attending a Cityfox label showcase loft party in SOHO, NYC. For those not familiar with Cityfox, it is a smaller label based in Switzerland that has featured the artistic talents of Mark Henning (UK/Berlin), Adriatique (Zurich) and Markus Lindner (Austria), and a few other solid names (cough…Jamie Jones). For one, I was glad to be going to an afterhours event in Manhattan and not the nether reaches of Brooklyn, where your typical Verboten or Blkmarket event is usually held. Not that it would ever would stop me (and no knocks on BK), but I was glad to be closer to where I was crashing for the night. In any case, this was a badass party; it was rigged with a sweet 3D light and sound installation as well as this this weird black light “forest” with a foam floor, which was like an adult Discovery Zone…pretty wonky. Last but not least, the party went from 11PM-8AM thereabouts and the music was nonstop awesome. I was very excited to see Mark Henning perform a live set, having been feeling his tracks for the last few months (See: Trojan [Cityfox], Chicago Sunrise [Cityfox], Supersonic [Clink], and especially his remix of Slam- Step Back [Soma]) Coincidentally, Henning was in NYC at the same time as me, and I decided to round up a few homies to catch him live. 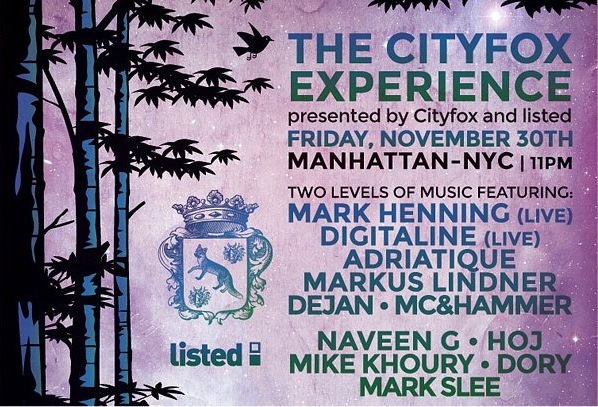 In the spirit of that night, here are some Cityfox (residency) live sets of recent vintage from Mark Henning and Markus Lindner–my favorite performers from that night. Henning’s is more on the minimal house/techno side of things, while Lindner’s is more experimental, jazzy deep house—definitely good on a pair of headphones. I was glad to hear Mark mix in his 2009 track “The Right Time” early the set because that is the exact track that got me into his music. I credit a Claude Vonstroke’s music taste circa 2009/10 for this. In any case, I hope you enjoy these mixes as much as I did and please be sure to support the artists. Enjoy!